After the success of the Chili Krab Burger, VeganBurg churns out sorbet with local flavor. The D24 Durian Sorbet is inspired by Singapore's well-loved king of fruits. The new sorbet addition is not only a tribute to the little Red Dot but also a sophisticated and creative take on a fruit that is absolutely adored by Singaporeans! To celebrate, VeganBurg will be offering customers 25% off any sorbet with the purchase of a meal from 25 August 2017, for a limited time only. SINGAPORE, 25 AUGUST 2017 - After the success of the Chili Krab Burger, VeganBurg is releasing another local favorite, yet again! The exotic D24 Durian Sorbet brings the story of sorbet coming to life with an exceptional flavour twist inspired by Singapore’s well-loved king of fruits. Paying homage to Singapore’s 52 years of independence, the D24 Durian Sorbet rekindles the kampung spirit in modern Singapore with the addition of fresh natural coconut cream. This sorbet is not only a tribute to the little Red Dot but also a sophisticated and creative take on a fruit that is absolutely adored by Singaporeans! VeganBurg’s director, Alex Tan, says the brand is conscious of keeping foodies on their toes when it comes to flavor creations. “We are constantly striving to push the flavor boundaries and give our fans something new and exciting, something they haven’t tasted before. 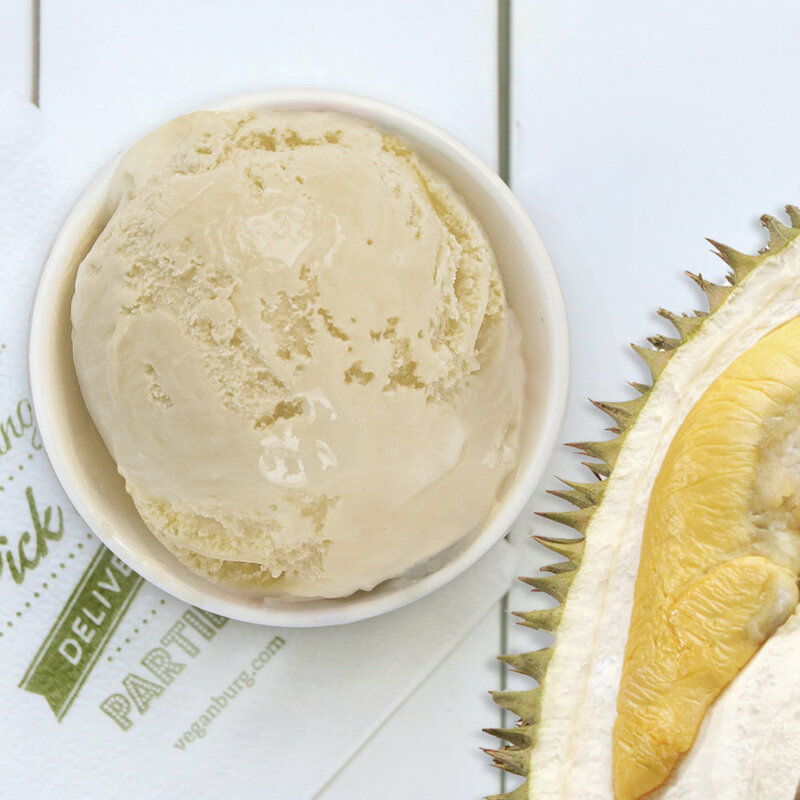 With each spoonful of the D24 Durian Sorbet, you will experience a distinctive and decadent new flavor that will make you wonder if you are actually savoring the fruit fresh from the husk,” Tan says. In celebration of the new D24 Durian Sorbet, VeganBurg will be offering customers 25% off any sorbet with the purchase of a meal for a limited time, available from 25 August 2017 in their founding outlet at 44 Jalan Eunos. The D24 Durian Sorbet is priced at $6.90. For more information visit veganburg.com/singapore. Since 2010, VeganBurg has been redefining food pop culture and comfort food with its delectable 100% plant-based menu. The fast casual restaurant is successfully pushing the limit and breaking the stereotype of how a burger should look and taste like - by mixing and matching colourful ingredients, plant-based burgers with daring flavours and gourmet sauces. Signature fan favorites include the “Creamy Shrooms” burger, “Seaweed Fries”, and “Sizzlin’’ Broccoli”. VeganBurg, headquartered in Singapore, highlights creative and delectable fresh 100% plant-based burgers and sidekicks. Veganising classic popular comfort food that are close to everyone’s hearts.